I’ve said it once and I’ll say it again: I have a pancake addiction. And possibly an addiction to St. Patrick’s Day too. I’ve blogged about my uncontainable love for Blueberry Lemon Pancakes and have already made allergy-friendly Soda Bread and Irish Cream Carob Cupcakes, though it’s only a few days into March. 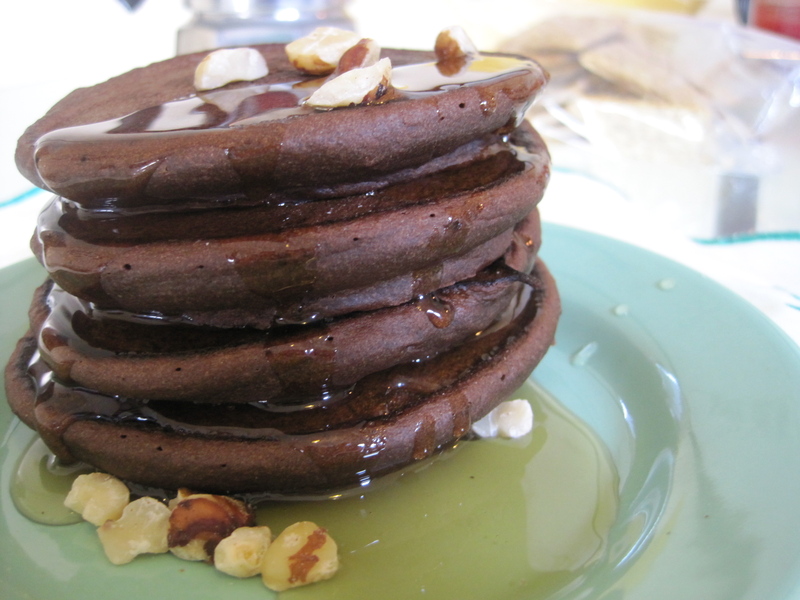 Yesterday morning, though, I just didn’t have time to make pancakes and blog the recipe. I had an audition and five articles to write, for Pete’s sake! No time for delicious food and playing when there’s work to be done, right? Yeah, you guessed it. I went into the kitchen. I just had to try out the first go of my new creation, Nutty Irishman St. Pat’s Pancakes. I mean, a girl’s gotta eat breakfast, right? And I had laundry down in the basement so my eye had to keep on a clock. What’s an extra half hour in the kitchen when there’s creation to be had, right? Addiction. But I know many of you out there are addicted too. As evident by your confessions on the last pancake addiction post. Yes, I think this support group should happen somewhere. In fact, I just bought AddictedToPancakes.Com. Message me if you want to be made an author and contribute a recipe, or just divulge a food addiction. This could be fun. Anyhoo, in the spirit both of St. Patrick’s Day and Pancake Addiction (which would make a good band name, no? ), I’ve made these. Dessert for breakfast. A coffee drink in a pancake. Somehow I captured a bit of the delicious after-dinner drink, though I used no whiskey (sniff). I ate a bunch. Now, notes: These are not that sweet. I used 4 Tbsp of sucanat to make the cocoa a bit fuller, but these do not taste like a brownie, cake or even chocolate muffin. They are definitely pancakes. If you want a sweeter treat, throw more sugar in there. And if you don’t mind a little alcohol in the morning, throw a shot or two in. Or soak your hazelnuts in whiskey for a while and then leave them out to dry / toast them. Yum. I’m gonna try that next time. Now I did this in a blender, because I was anticipating making it at my boyfriend’s apartment or my dad’s house, and they both have those and not other methods of equipment. You could also do this in a bowl on a standing mixer or with a hand mixer. The blender method was affective and did make pouring the pancakes easier, but I did get mix all over my white kitchen cabinets. It was funny. In a saucepan combine melt butter. Then add coffee and milk and heat on low until warmed. Whisk in the cocoa until combined completely. Pour in liquid measuring cup and set aside to cool. In a medium bowl, sift together remaining dry ingredients (flour, sugar, baking powder, salt). In a large bowl or blender, beat eggs until a tiny bit frothy. Then slowly add the liquid ingredients (retain about 1/4 cup) and beat to combine. Add the dry ingredients 1/2 cup at a time until incorporated. If the batter is a bit too thick, add remaining wet mixture. Let stand while you heat your cooking instrument (I used a griddle that covered two burners). 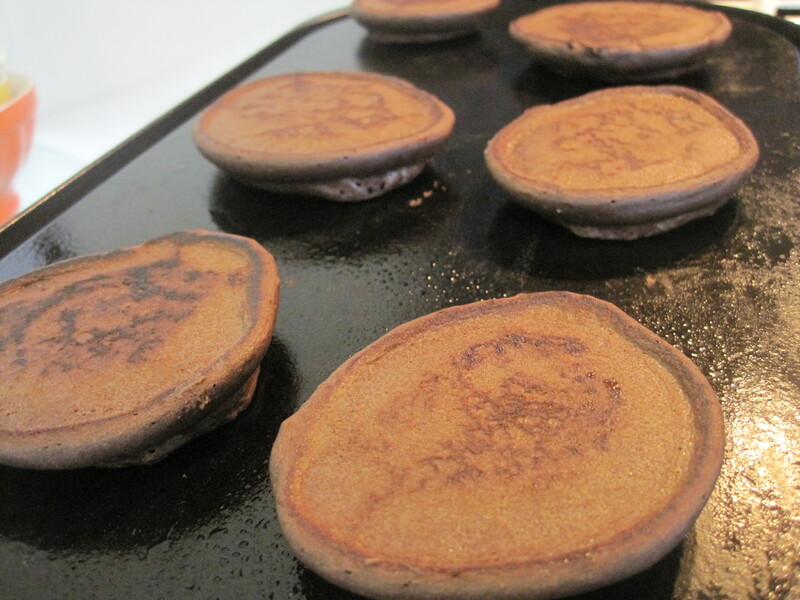 Now, these will brown more easily than other pancakes, so I recommend heating the surface well and then turning down the heat and letting it cool a tad. Bake on both sides until fluffy. This made me 14 small pancakes.